Over time, front doors experience a lot of wear and tear from daily use and exposure to the elements. This wear and tear can lead to energy waste and costly utility bills. In order to keep your home snug and your energy bills low, consider a front door replacement for your home. Is your front door cracked and warped? Has it been stained or damaged by heavy snow, rain, or intense heat? If so, you're probably in need of a front door replacement. A front door or garage door replacement can significantly improve your home's curb appeal, security, and energy efficiency. This process can be overwhelming, but our handy guide will help you navigate the intricacies of front door replacement. Generally, choosing a pre-hung door—a door already hanging in its own frame—makes front door replacement much easier. Additionally, when undertaking front door replacement, consider the material. Wood is often the most attractive, but this material is also expensive and tends to warp or rot easily. Steel is durable and inexpensive, but sometimes lacks the elegant finish of a wood door. 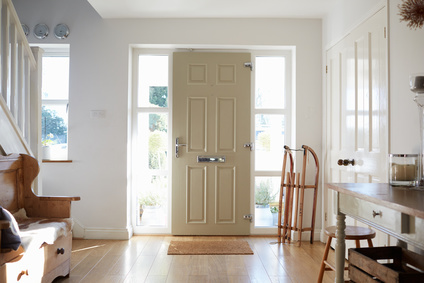 A fiberglass door combines the handsome features of a wood door with the resistance of a steel door for a much lower price than traditional wood. Each type of material has its pros and cons, so be sure to weigh your options carefully. Taking the time to check each of your door system’s components might seem tedious, but this step will ensure the success of your front door replacement project. That way, your door will last for a generation or more instead of eroding into an embarrassing eyesore within a few years. Again, this task seems obvious for anyone thinking about front door replacement, but this step actually requires considerable attention. When completing front door replacement, first remove your old door, then remove the interior trim, the exterior trim, and finally the jambs. Hiring a contractor can ensure that your door replacement is a smooth, stress-free process. Contractors provide homeowners with experience and professional expertise and can guarantee that your front door replacement is completed correctly and in a timely manner. This will prevent any future problems that may arise from incorrect installation. Following these tips should help make front door replacement a little more manageable. Be sure to check out HomeAdvancement’s easy links to find a contractor and a front door that you love.